The Goldfish Gazette, Issue #008 -- Goldfish Standards: What makes a champion goldfish? Goldfish Standards: What makes a champion goldfish? If you intend to breed your goldfish, you should know what the standard is for your variety. This will ensure you raise fry that are worthy of the time and effort you will need to put in to grow them to adulthood. The majority of goldfish enthusiasts keep goldfish purely for the enjoyment. Many enthusiasts however, want to go to the next level of goldfish keeping and breed their own goldfish dynasty. If you do decide to breed your goldfish, out of the possibly thousands of fry produced, how do you decide which fry you want to grow through to adulthood? If it is left to blind luck which fry survive, unless you breed the least developed varieties such as the Common or Comet, I can almost guarantee that the best fry will not be the fry that survive. If you know what the standard is for your goldfish variety you can, through selective culling, only grow those fry that are the closest to the accepted standard. 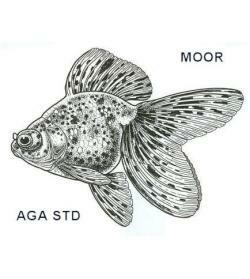 As an example, the image above is for the American Goldfish Association Moor standard. The standard starts by stating that "the Telescopic eye is a fish with a round body, paired fins, and protuberant eyes". The standard then goes into some detail about body shape, finnage eye types etc. Using this information, we can cull out those fry that don't meet the standard at an early stage, leaving more room and food for those that do. One of the advantages of culling spawns down to manageable levels is that the fry that survive the culls will have better conditions to grow in. This is particularly important if you expect your fry to develop into prize winners. So what have goldfish standards and champion goldfish have to do with each other? Goldfish standards are used as the first step in producing a champion goldfish. When you breed goldfish, you must cull them many times until you are left with a few individuals that are considered worthy of growing into adults. Goldfish standards help you get to this stage by identifying all the characteristics a particular variety must have. The few individuals chosen will still develop faults as they get closer to adulthood, leaving even fewer fish from the thousands you started with. If you are lucky, some of those last few may have a chance in a goldfish show to be crowned a champion. In most cases, it takes several generations to get to that level of perfection. Even if you produce a fish you consider meets all the criteria of a standard, it is up to a show judge to decide if your goldfish will be crowned a champion, based on his or her own interpretation of the standard. So luck has a part to play when champions are crowned. In some Asian cultures, goldfish are revered far more than they are in the West. To have one of your fish crowned a show champion is a huge honor, as well as substantially increasing the value of the fish. The majority of us will never enter a fish into a show, but by following accepted standards as closely as possible whenever we breed our goldfish, we can keep raising the standard. I've added a page on Goldfish standards with links to the American Goldfish Association standards and the Federation of British Aquatic Societies standards. Here is the link…Goldfish Standards. How to cull Goldfish fry.